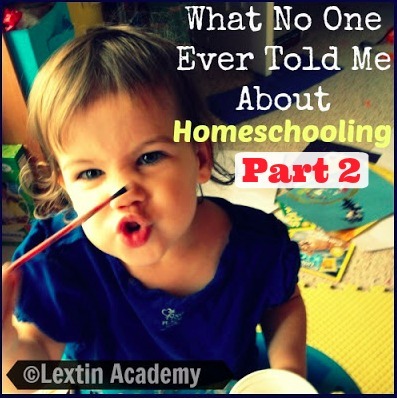 Homeschooling has its downfalls and I’ve discovered many of them the hard way. Your decision to homeschool should really come with a warning label. However, as hard as homeschooling may be, I’ve discovered that there are even more benefits. Homeschooling is amazing and wonderful and well worth the hard work! I knew homeschooling was for us. But I’ve been excited to see all the positive aspects and I’ve been pleasantly surprised at the unexpected benefits that all the other homeschoolers failed to mention. So, here’s What No One Ever Told Me About Homeschooling, Part 2 – the incredible, amazing, fun, interesting, and blessed reasons to get your homeschool journey under way. I have discovered I love to learn – I did not know this in school! I am addicted to teacher manuals and curriculum – there’s just so many fun ones to choose from! I love our snuggle movie days! We can even do school outside! The only school zone I have to worry about is the Lego school in my living room – don’t trip! I can serve my kids yummy and healthy meals – no cafeteria food here! We sometimes surprise dad at his office and kidnap him for lunch! We can even eat those snacks while we work – chocolate chips go great with math time! We can do art every single day! I get to teach my kids piano! We have so much extra play time – we take frequent Lego and Playmobil breaks! Homeschooling is hard work. It’s a ministry and it’s one that requires quite a bit of personal sacrifice. Ohhh, but the rewards are so worth it!